"COP THROWS ROCK AT PROTESTER!" A cop threw a rock at a protester??!! That's awful!! That's assault!! 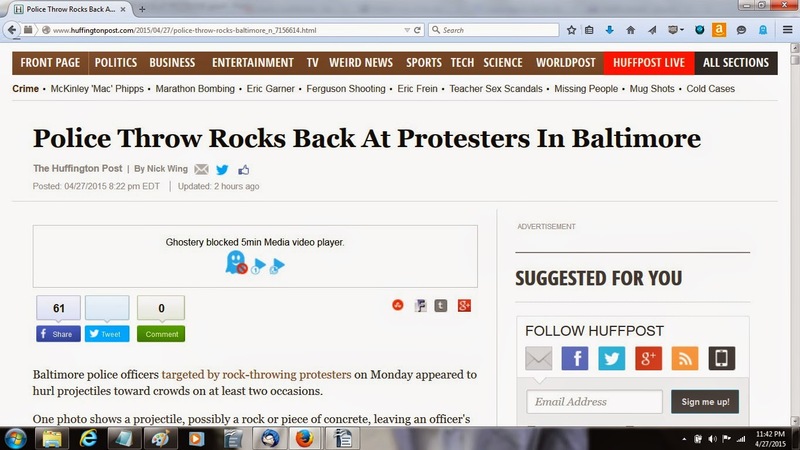 As HuffPost knows, or should know, rocks can be deadly!! Good for HuffPost for publicizing this, another unprovoked attack by a cop on a (presumably) unarmed citizen, (presumably) just minding his own business, (presumably) peacefully protesting this exact kind of barbaric behavior!! So by implication, the protesters are, of course, justified in attacking the cops!! They're just defending themselves!! And we would have no reason to doubt HuffPost -- after all, it's the #1 most-read online "newspaper" in the world, which has repeatedly claimed to be "nonpartisan." And even President Obama urges people to read it!! So this must be reliable information!! Grrrr!! 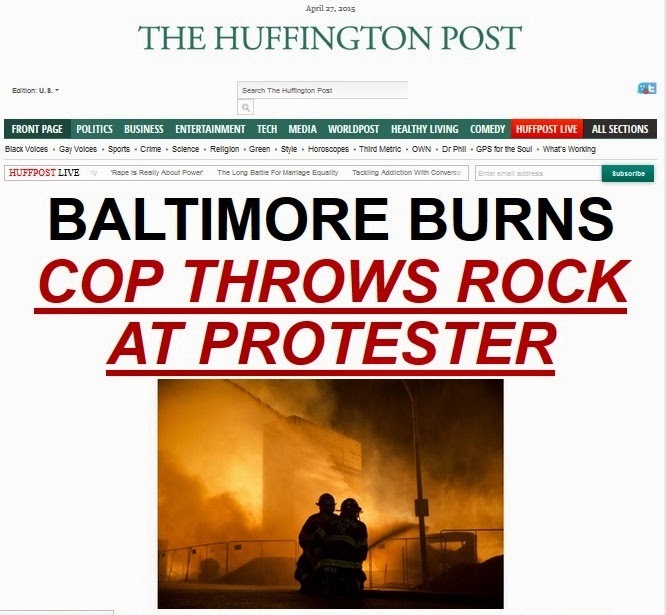 Let's examine this: HuffPost's original, breathless splash headline asserted that a cop (singular) threw a rock (singular) at a protester (singular). Yet HuffPost's "news" story page now says that the police (plural, as an agency) threw rocks (plural) back (as in, in a defensive tactic) at protesters (plural). Wow, that's quite a difference!! So what actually happened? Fifteen police officers were injured Monday - two seriously - in the clashes with angry mobs rioting over the death of Freddie Gray. That puts a bit of a different spin on the story, don't you think? Gee, that looks pretty frightening! Can you imagine being one of a handful of cops, facing hundreds of "protesters" throwing bricks, rocks and Moltov cocktails at you, after fifteen of your fellow officers had been injured, two severely? Think you might be tempted to throw one of those rocks raining down on you back at one of the savage thugs "protesters" who threw it? Somehow, HuffPost's "news" story left those little details out. Bottom line: this was a single cop, momentarily reacting to a mob that was trying to kill him and his fellow officers. HuffPost knew that. "[At HuffPost] there are guidelines that have to be followed -- and they include a prohibition on conspiracy theories or inflammatory claims. [...] For context, it's good to remember that Glenn Beck didn't come out of nowhere. He's the latest example of what the great historian Richard Hofstadter called "the paranoid style in American politics," which he defined as angry minds that traffic in "heated exaggeration, suspiciousness, and conspiratorial fantasy," and that see "the fate of conspiracy in apocalyptic terms... always manning the barricades of civilization." In perpetrating this latest incendiary hoax, HuffPost once again gave tacit justification, on clearly false basis, to street thugs to attack cops, by asserting that if they do, they're only defending themselves. "BALTIMORE IS BURNING BECAUSE PEOPLE WITH NOTHING TO LOSE WILL DESTROY ANYTHING IN THEIR WAY"
America is burning with racism, with hate, with violence. Baltimore is burning because far too many of us are on the sidelines doing nothing to affect change, or have become numb as the abnormal has become normal. 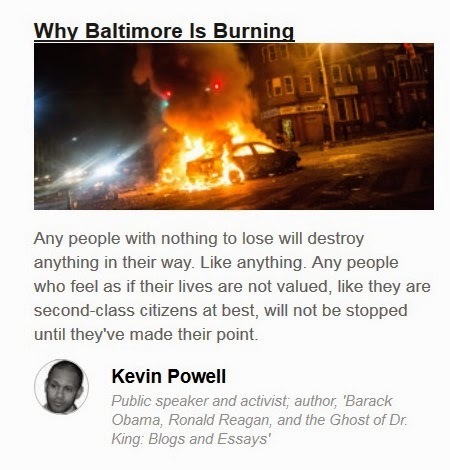 Baltimore is burning because very few of us are committed to real leadership, to a real agenda with consistent and real political, economic, and cultural strategies for those American communities most under siege, most vulnerable. Policing them to death is not the solution. Putting them in prison is not the solution. And, clearly, ignoring them is not the solution. These murderous thugs have nothing to lose? They are in the position of the Jews in the Warsaw Ghetto, on the verge of being wiped out by Nazi stormtroopers? They don't have the freedom to organize, to act peacefully to resolve the problems they claim are holding them back (in a leftist stronghold for decades)? Once again, HuffPost gives explicit moral justification for the violence and mayhem that it is helping to incite. 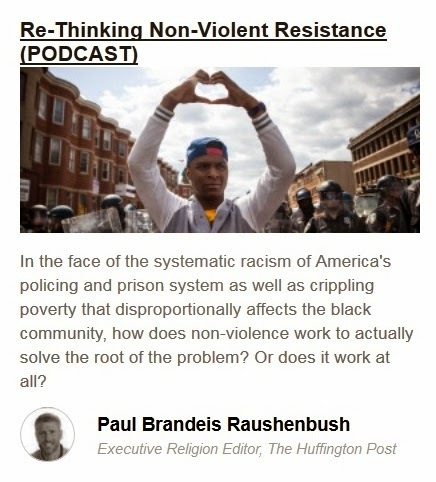 In the face of the systematic racism of America's policing and prison system as well as crippling poverty that disproportionally affects the black community, how does non-violence work to actually solve the root of the problem? Or does it work at all? By the way, "resistance" is a loaded term, that Palestinians are well-known for using to justify its terrorism. HuffPost didn't bother to mention that fact; perhaps because for years it has been the unofficial voicepiece of the Palestinian terror group Hamas, which claims that by raining rockets down on Israeli cities and murdering Jews, it is practicing "resistance." Is HuffPost actually trying to get more police officers killed?